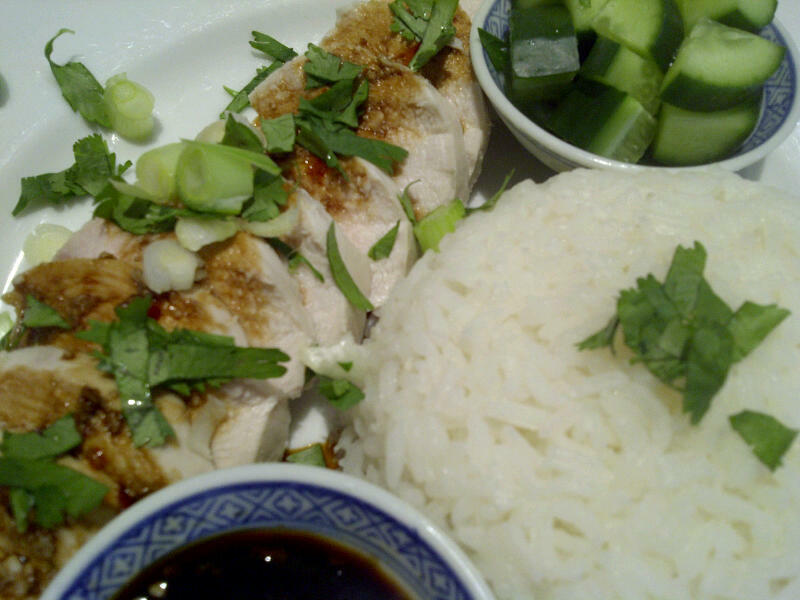 When I lived in Singapore I was hooked on a dish called Hainanese chicken rice. Poached chicken, a spicy dipping sauce, a few rings of cucumber and rice cooked in chicken stock (or, more likely, fat – how else could it taste so good?). Such a simple dish but brimming with flavour. I took my mum to try it when she visited me, but it wasn’t her thing – she poured curry sauce over the rice. I stifled a gasp. We’ve been recreating the dish at home recently and the kids love it. Sprog 1 slurps the spicy sauce, Sprog 2 has hers without. Method: Place the chicken breasts in a large saucepan. Pour over chicken stock and enough water to cover them. Bring to the boil. Remove from heat, cover and leave for 15 minutes. Remove chicken from stock and cover with foil on a plate to keep warm. Add rice to the leftover stock – top up with a little extra water if necessary – bring to the boil and cook until tender, then drain. While the rice is cooking, dice some cucumber and make the dipping sauce by mixing together the soy, lime, garlic and chilli. To assemble the dish, pack rice into a small Chinese bowl. Place a dinner plate over the bowl then invert to give yourself a lovely, neat mound. Thickly slice the chicken breast and arrange on each plate. Sprinkle with coriander and shallots. Add little dishes of sauce and diced cucumber on the side. Serve. This is one of my favs, too! A Chinese friend put me on to a prepared paste if you are interested. Can by it in the supermarket, brand is Asian Home Gourmet packet is Singapore Hainanese Chicken Rice. It recommends cooking the chicken on top of the rice for a bit of time saving! !